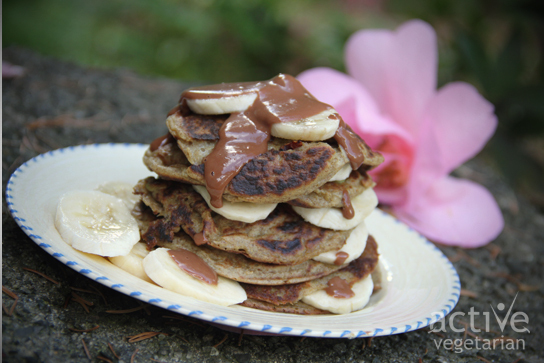 Our latest pancake creation uses a classic combo of peanut butter, chocolate and banana. These are gluten free, vegan pancakes with a lovely peanut butter taste and chunks of banana rather than it being mashed. Oh and if you make too many (can you though? Can you ever make too many pancakes? ), they can always be stored in a glass tupperware container and keeping in the fridge for up to a few days. Mix in coconut oil until mixture resembles coarse meal. Heat an ungreased, nonstick skillet over medium-high heat. It’s hot enough when a drop of water flicked across the surface immediately sizzles. Serve hot, with sliced bananas and chocolate peanut butter sauce. Place chocolate, peanut butter and coconut milk together in pot on medium heat stirring constantly until melted. Remove the pot from heat and add the vanilla. Blend well, cool slightly — best served warm.